You have added Ivory Elegant Palazzo Suit to your Shopping Bag! Cast a spell in this magnificent Ivory colour, medium flared palazzo style suit. The straight cut silk kurti is embellished with beautiful silver accents, mirror work and has beautiful bell pattern sleeves. 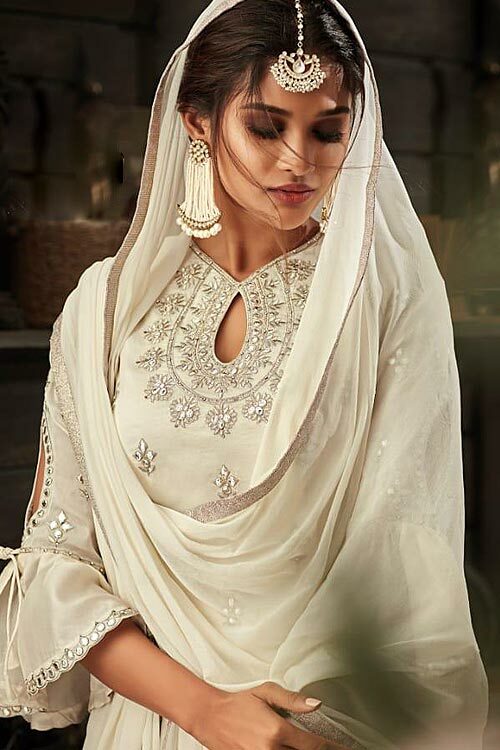 It comes with a matchingChinon dupatta with sleek silver lace all around and Santoon palazzo pants that features all over mirror and beaded work in silver. Get ready for any special occasion by accessorising your look with a maang tika and stunning silver/ pearl earrings. Our inhouse specialist tailors try their best to stitch the style chosen by you in the most beautiful way. The stitching will be boutique style and will be done in a skillful way. For plus sizes or for XXL and more , there could be an additional charge for stitching as the material used could be more and as we have these styles in semi-stitched pattern, more time may be needed to tailor the item with extra large sizes. With Semi stitched dress material, you will be able to get the outfit customised /tailored just as per your size. The material will come with a pattern, like the neck pattern, sleeves with embroidery/ pattern ,semi stitched skirt/bottom with the flair and beautiful border/hem which you will then easily be able to get it customised/adjusted as per your size. The finished outfit, once customised as per your size will look just the same as on the model in the picture. All materials come with dupatta, salwar /churidar fabric as shown in the picture.